Review • The Broadway star and the British actor are guests on the popular Christmas show. (Francisco Kjolseth | The Salt Lake Tribune) The Mormon Tabernacle Choir Christmas extravaganza kicks off with Broadway star Sutton Foster and Downton Abbey's Hugh Bonneville at the Conference Center on Thursday, Dec. 14, 2017. (Francisco Kjolseth | The Salt Lake Tribune) The Mormon Tabernacle Choir Christmas extravaganza kicks off with Broadway star Sutton Foster and Downton Abbey's Hugh Bonneville at the Conference Center on Thursday, Dec. 14, 2017. (Francisco Kjolseth | The Salt Lake Tribune) The Mormon Tabernacle Choir Christmas extravaganza kicks off with Broadway star Sutton Foster and Downton Abbey's Hugh Bonneville at the Conference Center on Thursday, Dec. 14, 2017. (Francisco Kjolseth | The Salt Lake Tribune) The Mormon Tabernacle Choir Christmas extravaganza kicks off with Broadway star Sutton Foster and Downton Abbey's Hugh Bonneville at the Conference Center on Thursday, Dec. 14, 2017. (Francisco Kjolseth | The Salt Lake Tribune) The Mormon Tabernacle Choir Christmas extravaganza kicks off with Broadway star Sutton Foster and Downton Abbey's Hugh Bonneville at the Conference Center on Thursday, Dec. 14, 2017. (Francisco Kjolseth | The Salt Lake Tribune) The Mormon Tabernacle Choir Christmas extravaganza kicks off with Broadway star Sutton Foster and Downton Abbey's Hugh Bonneville at the Conference Center on Thursday, Dec. 14, 2017. (Francisco Kjolseth | The Salt Lake Tribune) The Mormon Tabernacle Choir Christmas extravaganza kicks off with Broadway star Sutton Foster and Downton Abbey's Hugh Bonneville at the Conference Center on Thursday, Dec. 14, 2017. (Francisco Kjolseth | The Salt Lake Tribune) The Mormon Tabernacle Choir Christmas extravaganza kicks off with Broadway star Sutton Foster and Downton Abbey's Hugh Bonneville at the Conference Center on Thursday, Dec. 14, 2017. (Francisco Kjolseth | The Salt Lake Tribune) The Mormon Tabernacle Choir Christmas extravaganza kicks off with Broadway star Sutton Foster and Downton Abbey's Hugh Bonneville at the Conference Center on Thursday, Dec. 14, 2017. 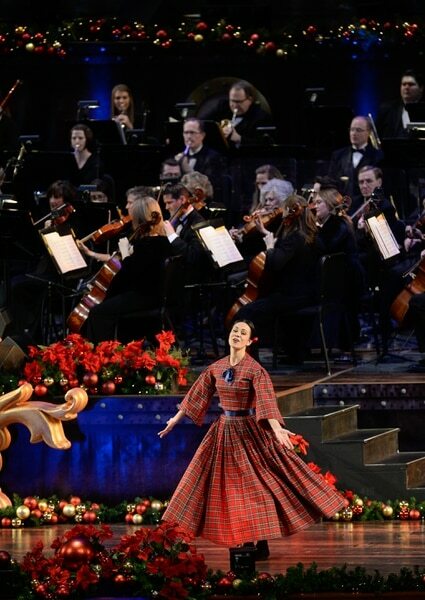 (Francisco Kjolseth | The Salt Lake Tribune) The Mormon Tabernacle Choir Christmas extravaganza kicks off with Broadway star Sutton Foster and Downton Abbey's Hugh Bonneville at the Conference Center on Thursday, Dec. 14, 2017. (Francisco Kjolseth | The Salt Lake Tribune) The Mormon Tabernacle Choir Christmas extravaganza kicks off with Broadway star Sutton Foster and Downton Abbey's Hugh Bonneville at the Conference Center on Thursday, Dec. 14, 2017. (Francisco Kjolseth | The Salt Lake Tribune) The Mormon Tabernacle Choir Christmas extravaganza kicks off with Broadway star Sutton Foster and Downton Abbey's Hugh Bonneville at the Conference Center on Thursday, Dec. 14, 2017. (Francisco Kjolseth | The Salt Lake Tribune) The Mormon Tabernacle Choir Christmas extravaganza kicks off with Broadway star Sutton Foster and Downton Abbey's Hugh Bonneville at the Conference Center on Thursday, Dec. 14, 2017. (Francisco Kjolseth | The Salt Lake Tribune) The Mormon Tabernacle Choir Christmas extravaganza kicks off with Broadway star Sutton Foster and Downton Abbey's Hugh Bonneville at the Conference Center on Thursday, Dec. 14, 2017. (Francisco Kjolseth | The Salt Lake Tribune) The Mormon Tabernacle Choir Christmas extravaganza kicks off with Broadway star Sutton Foster and Downton Abbey's Hugh Bonneville at the Conference Center on Thursday, Dec. 14, 2017. (Francisco Kjolseth | The Salt Lake Tribune) The Mormon Tabernacle Choir Christmas extravaganza kicks off with Broadway star Sutton Foster and Downton Abbey's Hugh Bonneville at the Conference Center on Thursday, Dec. 14, 2017. (Francisco Kjolseth | The Salt Lake Tribune) The Mormon Tabernacle Choir Christmas extravaganza kicks off with Broadway star Sutton Foster and Downton Abbey's Hugh Bonneville at the Conference Center on Thursday, Dec. 14, 2017. (Francisco Kjolseth | The Salt Lake Tribune) The Mormon Tabernacle Choir Christmas extravaganza kicks off with Broadway star Sutton Foster and Downton Abbey's Hugh Bonneville at the Conference Center on Thursday, Dec. 14, 2017. (Francisco Kjolseth | The Salt Lake Tribune) The Mormon Tabernacle Choir Christmas extravaganza kicks off with Broadway star Sutton Foster and Downton Abbey's Hugh Bonneville at the Conference Center on Thursday, Dec. 14, 2017. (Francisco Kjolseth | The Salt Lake Tribune) The Mormon Tabernacle Choir Christmas extravaganza kicks off with Broadway star Sutton Foster and Downton Abbey's Hugh Bonneville at the Conference Center on Thursday, Dec. 14, 2017. (Francisco Kjolseth | The Salt Lake Tribune) The Mormon Tabernacle Choir Christmas extravaganza kicks off with Broadway star Sutton Foster and Downton Abbey's Hugh Bonneville at the Conference Center on Thursday, Dec. 14, 2017. (Francisco Kjolseth | The Salt Lake Tribune) The Mormon Tabernacle Choir Christmas extravaganza kicks off with Broadway star Sutton Foster and Downton Abbey's Hugh Bonneville at the Conference Center on Thursday, Dec. 14, 2017. (Francisco Kjolseth | The Salt Lake Tribune) The Mormon Tabernacle Choir Christmas extravaganza kicks off with Broadway star Sutton Foster and Downton Abbey's Hugh Bonneville at the Conference Center on Thursday, Dec. 14, 2017. (Francisco Kjolseth | The Salt Lake Tribune) The Mormon Tabernacle Choir Christmas extravaganza kicks off with Broadway star Sutton Foster and Downton Abbey's Hugh Bonneville at the Conference Center on Thursday, Dec. 14, 2017. (Francisco Kjolseth | The Salt Lake Tribune) The Mormon Tabernacle Choir Christmas extravaganza kicks off with Broadway star Sutton Foster and Downton Abbey's Hugh Bonneville at the Conference Center on Thursday, Dec. 14, 2017. (Francisco Kjolseth | The Salt Lake Tribune) The Mormon Tabernacle Choir Christmas extravaganza kicks off with Broadway star Sutton Foster and Downton Abbey's Hugh Bonneville at the Conference Center on Thursday, Dec. 14, 2017. (Francisco Kjolseth | The Salt Lake Tribune) The Mormon Tabernacle Choir Christmas extravaganza kicks off with Broadway star Sutton Foster and Downton Abbey's Hugh Bonneville at the Conference Center on Thursday, Dec. 14, 2017. (Francisco Kjolseth | The Salt Lake Tribune) The Mormon Tabernacle Choir Christmas extravaganza kicks off with Broadway star Sutton Foster and Downton Abbey's Hugh Bonneville at the Conference Center on Thursday, Dec. 14, 2017. (Francisco Kjolseth | The Salt Lake Tribune) The Mormon Tabernacle Choir Christmas extravaganza kicks off with Broadway star Sutton Foster and Downton Abbey's Hugh Bonneville at the Conference Center on Thursday, Dec. 14, 2017. (Francisco Kjolseth | The Salt Lake Tribune) The Mormon Tabernacle Choir Christmas extravaganza kicks off with Broadway star Sutton Foster and Downton Abbey's Hugh Bonneville at the Conference Center on Thursday, Dec. 14, 2017. (Francisco Kjolseth | The Salt Lake Tribune) The Mormon Tabernacle Choir Christmas extravaganza kicks off with Broadway star Sutton Foster and Downton Abbey's Hugh Bonneville at the Conference Center on Thursday, Dec. 14, 2017. (Francisco Kjolseth | The Salt Lake Tribune) The Mormon Tabernacle Choir Christmas extravaganza kicks off with Broadway star Sutton Foster and Downton Abbey's Hugh Bonneville at the Conference Center on Thursday, Dec. 14, 2017. (Francisco Kjolseth | The Salt Lake Tribune) The Mormon Tabernacle Choir Christmas extravaganza kicks off with Broadway star Sutton Foster and Downton Abbey's Hugh Bonneville at the Conference Center on Thursday, Dec. 14, 2017. (Francisco Kjolseth | The Salt Lake Tribune) The Mormon Tabernacle Choir Christmas extravaganza kicks off with Broadway star Sutton Foster and Downton Abbey's Hugh Bonneville at the Conference Center on Thursday, Dec. 14, 2017. (Francisco Kjolseth | The Salt Lake Tribune) The Mormon Tabernacle Choir Christmas extravaganza kicks off with Broadway star Sutton Foster and Downton Abbey's Hugh Bonneville at the Conference Center on Thursday, Dec. 14, 2017. (Francisco Kjolseth | The Salt Lake Tribune) The Mormon Tabernacle Choir Christmas extravaganza kicks off with Broadway star Sutton Foster and Downton Abbey's Hugh Bonneville at the Conference Center on Thursday, Dec. 14, 2017. (Francisco Kjolseth | The Salt Lake Tribune) The Mormon Tabernacle Choir Christmas extravaganza kicks off with Broadway star Sutton Foster and Downton Abbey's Hugh Bonneville at the Conference Center on Thursday, Dec. 14, 2017. (Francisco Kjolseth | The Salt Lake Tribune) The Mormon Tabernacle Choir Christmas extravaganza kicks off with Broadway star Sutton Foster and Downton Abbey's Hugh Bonneville at the Conference Center on Thursday, Dec. 14, 2017. (Francisco Kjolseth | The Salt Lake Tribune) The Mormon Tabernacle Choir Christmas extravaganza kicks off with Broadway star Sutton Foster and Downton Abbey's Hugh Bonneville at the Conference Center on Thursday, Dec. 14, 2017. (Francisco Kjolseth | The Salt Lake Tribune) The Mormon Tabernacle Choir Christmas extravaganza kicks off with Broadway star Sutton Foster and Downton Abbey's Hugh Bonneville at the Conference Center on Thursday, Dec. 14, 2017. (Francisco Kjolseth | The Salt Lake Tribune) The Mormon Tabernacle Choir Christmas extravaganza kicks off with Broadway star Sutton Foster and Downton Abbey's Hugh Bonneville at the Conference Center on Thursday, Dec. 14, 2017. (Francisco Kjolseth | The Salt Lake Tribune) The Mormon Tabernacle Choir Christmas extravaganza kicks off with Broadway star Sutton Foster and Downton Abbey's Hugh Bonneville at the Conference Center on Thursday, Dec. 14, 2017. (Francisco Kjolseth | The Salt Lake Tribune) The Mormon Tabernacle Choir Christmas extravaganza kicks off with Broadway star Sutton Foster and Downton Abbey's Hugh Bonneville at the Conference Center on Thursday, Dec. 14, 2017. (Francisco Kjolseth | The Salt Lake Tribune) The Mormon Tabernacle Choir Christmas extravaganza kicks off with Broadway star Sutton Foster and Downton Abbey's Hugh Bonneville at the Conference Center on Thursday, Dec. 14, 2017. (Francisco Kjolseth | The Salt Lake Tribune) The Mormon Tabernacle Choir Christmas extravaganza kicks off with Broadway star Sutton Foster and Downton Abbey's Hugh Bonneville at the Conference Center on Thursday, Dec. 14, 2017. (Francisco Kjolseth | The Salt Lake Tribune) The Mormon Tabernacle Choir Christmas extravaganza kicks off with Broadway star Sutton Foster and Downton Abbey's Hugh Bonneville at the Conference Center on Thursday, Dec. 14, 2017. (Francisco Kjolseth | The Salt Lake Tribune) The Mormon Tabernacle Choir Christmas extravaganza kicks off with Broadway star Sutton Foster and Downton Abbey's Hugh Bonneville at the Conference Center on Thursday, Dec. 14, 2017. (Francisco Kjolseth | The Salt Lake Tribune) The Mormon Tabernacle Choir Christmas extravaganza kicks off with Broadway star Sutton Foster and Downton Abbey's Hugh Bonneville at the Conference Center on Thursday, Dec. 14, 2017. (Francisco Kjolseth | The Salt Lake Tribune) The Mormon Tabernacle Choir Christmas extravaganza kicks off with Broadway star Sutton Foster and Downton Abbey's Hugh Bonneville at the Conference Center on Thursday, Dec. 14, 2017. (Francisco Kjolseth | The Salt Lake Tribune) The Mormon Tabernacle Choir Christmas extravaganza kicks off with Broadway star Sutton Foster and Downton Abbey's Hugh Bonneville at the Conference Center on Thursday, Dec. 14, 2017. “What a spectacular drawing room you have here,” Hugh Bonneville exclaimed as he took the stage of the LDS Conference Center on Thursday night. 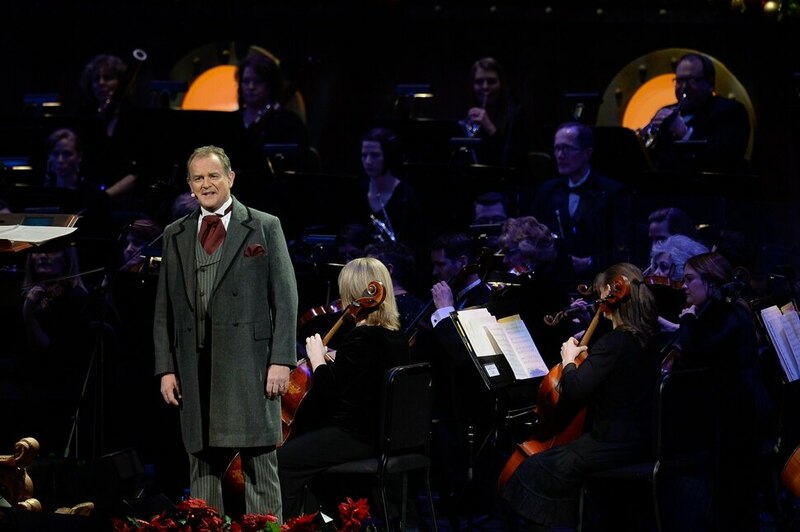 The British actor, best known for his portrayal of an early 20th-century earl on the popular period drama “Downton Abbey,” was a guest of the Mormon Tabernacle Choir and Orchestra at Temple Square on their annual Christmas extravaganza. He shared the bill with two-time Tony winner Sutton Foster, whose radiant personality was easily big enough to fill the hangar-size hall. Foster charmed the crowd with warm renditions of seasonal songs such as Vince Guaraldi’s “Christmas Time Is Here” (from “A Charlie Brown Christmas”) and a high-energy medley that included “Have Yourself a Merry Little Christmas,” as well as surprisingly touching performances of “Pure Imagination” (from “Willy Wonka and the Chocolate Factory”) and John Denver’s “Sunshine on My Shoulders,” the latter dedicated to her late mother. Bonneville gracefully guided the mood from celebratory to solemn as he recounted how 19th-century American lawyer Horatio Spafford wrote the Christian hymn “It Is Well With My Soul” after his four daughters were lost at sea — and how Spafford, his wife, Anna, and their surviving children subsequently dedicated their lives to charitable work. In a surprising twist, Wilberg also invited the throng to sing along on “Jingle Bells.” For the most part, the giant chorus followed Wilberg’s admonition to “listen with your eyes,” the trick to staying in synch when your conductor is a football field’s length away. 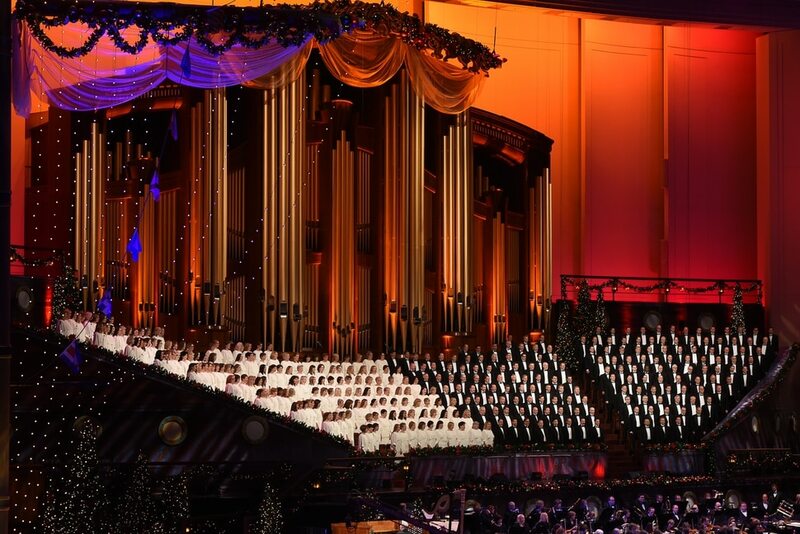 The Mormon Tabernacle Choir and Orchestra at Temple Square will present their Christmas concerts featuring Broadway star Sutton Foster and British actor Hugh Bonneville. When • Reviewed Thursday, Dec. 14; repeats Friday and Saturday, Dec. 15-16, 8 p.m.
Didn’t get tickets? • If you didn’t get one of the free tickets, try the standby line, which starts at the north gate of Temple Square. You’ll be seated in the Tabernacle to wait for available seats in the Conference Center, and you can stay there and watch a live broadcast if you don’t get in. Also • Foster and Bonneville will appear on the choir’s weekly broadcast of “Music and the Spoken Word” Sunday, Dec. 17, at 9:30 a.m. in the Conference Center. No tickets are required, but be in your seat by 9:15 — or just tune in to KSL (Channel 5).